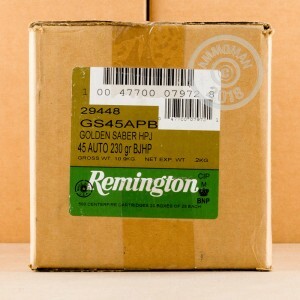 Remington Golden Saber ammunition provides dependable penetration and expansion for those situations when you're forced to defend yourself. 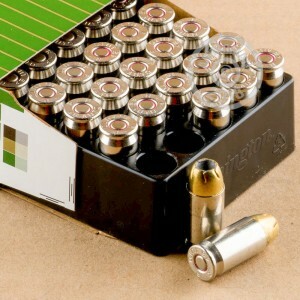 Each cartridge in this box of 25 fires a 230 grain jacketed hollow point bullet at a muzzle velocity of 875 feet per second. This is a standard pressure load well suited to the constraints of subcompact or older firearms. This ammo is made in Lonoke, Arkansas using non-corrosive Boxer primers and nickel-plated brass cases. 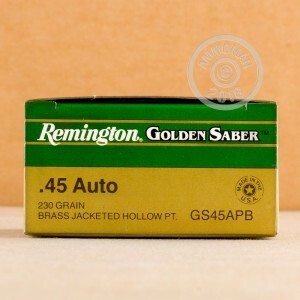 Stock up for the range, for self-defense, and for the hunt at AmmoMan.com. Remember, all orders over $99 ship for free!